I am an amateur when it comes to baking cookies. I probably have made it before once or twice (Diwali cookies included), really an amateur. So when I received invitations for cookie exchanges this year, I was worried. 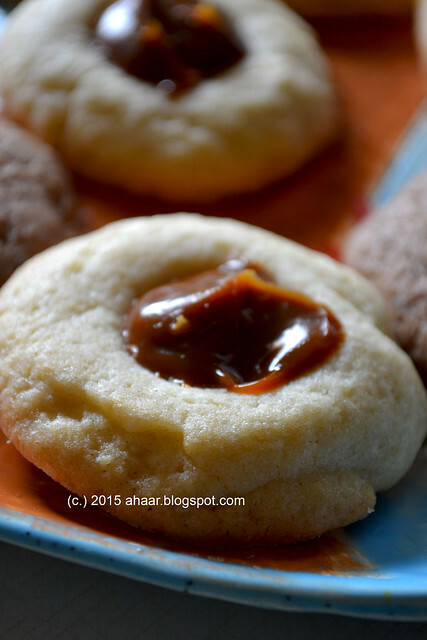 I needed a basic recipe and when I asked a friend, she mentioned thumbprint cookies. "They're easy to make and you can put anything in the middle." That was exciting. 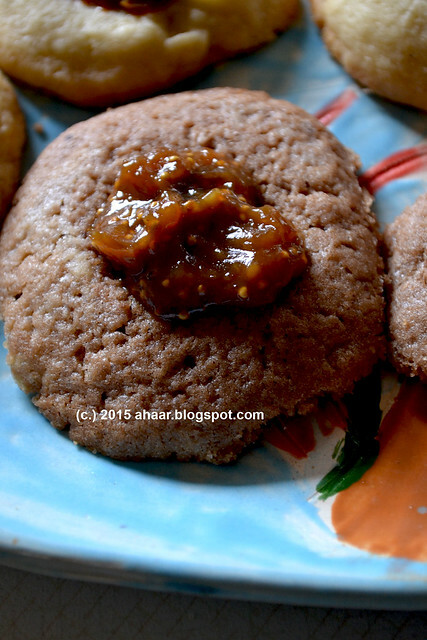 Instead of traditional jam, I chose to put caramel and fig jam in the cookies. I bought ready made caramel, but made the jam at home. I did leave some plain for the kids and they chose to fill their cookies with chocolate and jam. So if you are looking for a last minute recipe for the holidays, look no further. Sieve the flour, baking powder and salt together. Beat the butter and sugar together till it turns fluffy about 4-5 minutes scrapping the sides occasionally. Then add the egg and vanilla extract and mix again. Once it's mixed add in the flour in a couple of batches. At this point I divided the dough in two batches eyeballing it mostly. Then melt the chocolate in the microwave, heating for 30 seconds at a time till it all melts. Add a tspoon of water if needed. Add the melted chocolate to one batch and mix again till it is incorporated well. Line 2 sheets with parchment paper and add the cookies dough in small balls on the sheet. Make a deep thumbprint in the middle and let it bake for 15-20 minutes. If needed, about halfway through, take the cookies out, redo the thumbprints with a small spoon and finish baking till they are golden around the edges. Transfer them to a wire rack and cool before adding the filling. 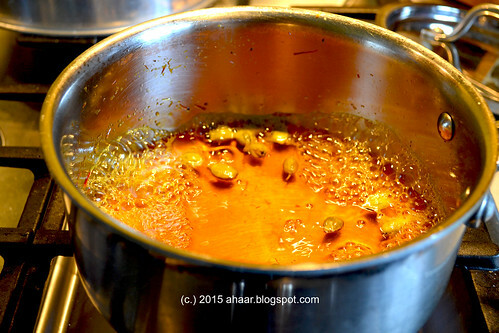 Cook the fig with all the ingredients on low heat till it becomes a thick jam consistency about 20-25 minutes. Add the caramel and fig in the middle. 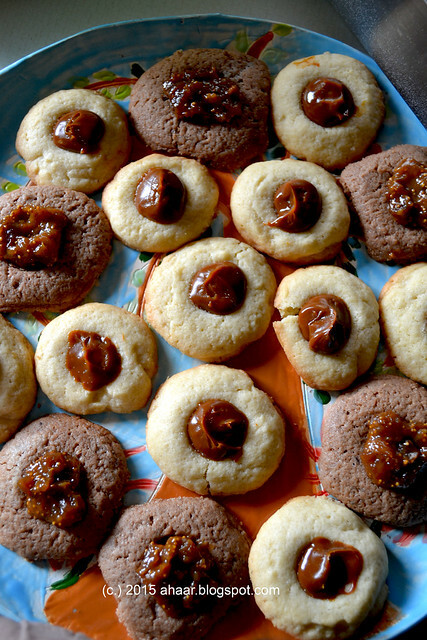 I added caramel on vanilla cookies and fig on chocolate cookies. They are ready to serve. Enjoy and have a safe and happy holiday season. This is a recipe that makes any occasion special. And when you are cooking it, it makes the entire house smell wonderful too with the aroma of saffron and lemon wafting as you get the dinner table set for your holiday meal. Trust me, you cannot go wrong with this one. The recipe is from one of my favorite authors Yottam Ottolenghi and it's easy to make. It can even be made the night before so the pears can soak up some of the delicious syrup. It works best with firm pears that will hold it's shape after boiling. I didn't tweak the recipe much other than reducing the sugar slightly, cutting the pears in half and serving it with some gelato instead of creme fraîche. Bon appetit has the recipe. Combine the lemon juice, cardamom, saffron, wine and water together in a pan and stir over medium heat till the sugar dissolves. Then put the pears in and bring the heat to simmer. Let it cook on low for about 20-25 minutes and then take the pears out. Reduce the syrup further by cooking in another 10-15 minutes. Let it cool to room temperature. 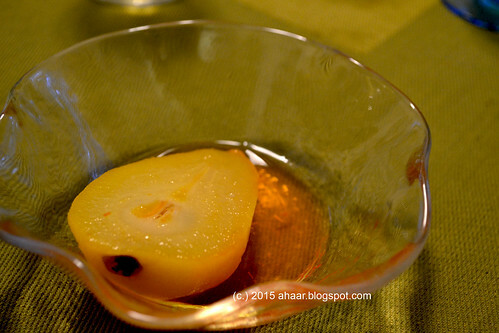 For serving, spoon some of the syrup over the pear and serve.